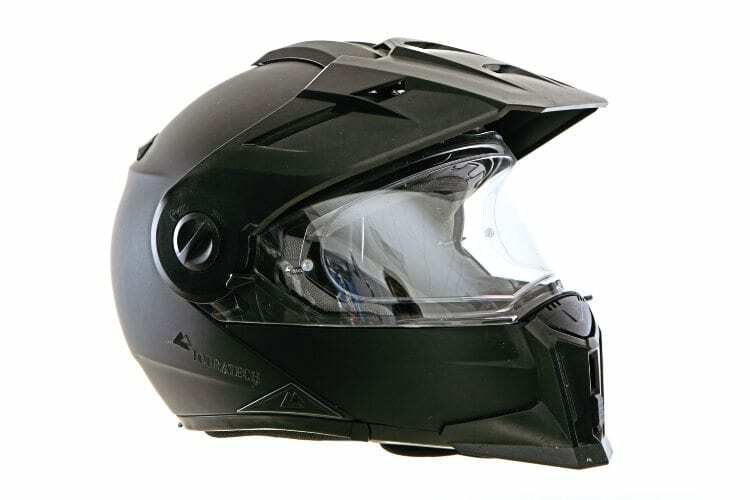 I like a helmet that works for more than just one type of riding, and the Touratech Aventuro Mod certainly fits that bill: it’s a flip-front, touring and adventure helmet all in one. 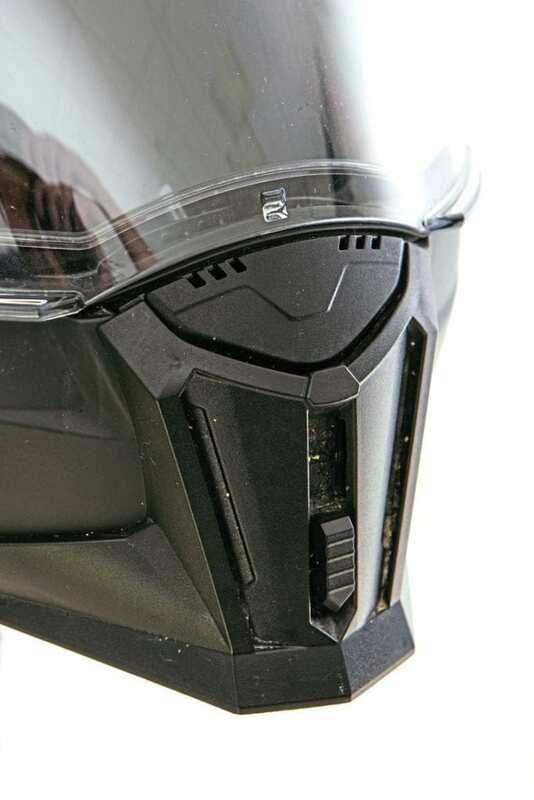 If you think that it looks a lot like the Schuberth E1, then you’re on the right tracks – this is essentially the same helmet with added styling and features from Touratech. The Aventuro features the same wide aperture visor as the E1, but the vents and chin profiling give it a bit more of an adventure helmet look. The flip mechanism is easily operated via a button under the chin bar, and the front stays up securely enough. 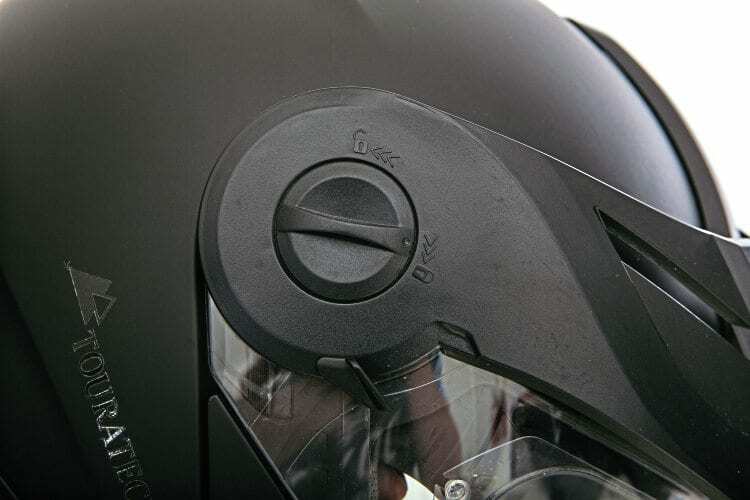 The peak is easily removable and three-step adjustable with no tools needed, adding to the versatility of the helmet. The peak is three-way adjustable and removeable. The integrated sun visor is a nice touch, and it means you don’t need a pair of shades with you. The fit is great, the lining plush, and the noise levels low, combining to make this a very comfortable helmet. It feels nice and light too. The sun visor is good enough to leave your shades at home. I love that there’s plenty of air flowing into the helmet and a Pinlock lens on the large visor to give me a clear view ahead. Ventilation is excellent, thanks to the large vents. The only thing I would change is the micro-ratchet buckle in the strap. I’d rather have a double-D fastener, but that’s just a personal preference. 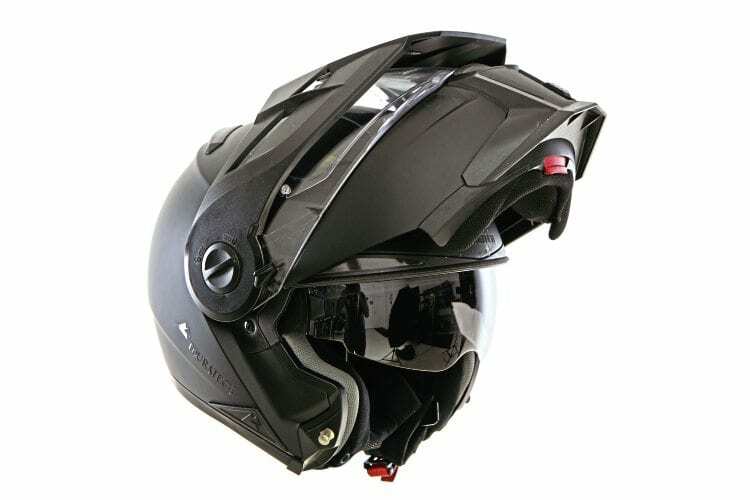 Overall, this is a top-quality helmet that lends itself to anything from touring to trail riding.